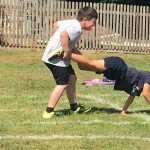 In celebration of National School Sports Week, proud mum (and Chiropractic Assistant) Tracy talks about her boys’ sports days and gives some tips on how to help them have fun and stay well. 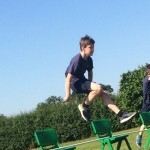 Student Harry, shares his experience of sports day as a competitor. The sun is shining, the evenings are long, June is drawing to a glorious close. If you have school-age kids that can mean only one thing – the summer holidays are approaching and that means SPORTS DAY! Do you love it? Or do you secretly hate it? In theory it’s for the students but, let’s face it, mums and dads always get involved too. Here are our experiences from either side of that generational line. “As mum to 4 boys, I have been involved in more Sports Days than I care to remember. In my experience, parents fall into one of two categories – they either get very competitive and run to the start line – or they run for the hills and hide!!! But regardless of how we feel about it, we all want our kids to come first and win all the gold medals. All year round, we encourage our kids to take after-school sport lessons to improve their fitness and get more fresh air but at Sports Day, all bets are off! A part of us turns into that parent – you know the one, the one who suddenly turns ultra-competitive and yells encouragement from the sidelines; we pack them off to school with extra water, sun hats and lots of words of encouragement, “Do well, but it’s also ok if you don’t do well” all the time secretly hoping they beat that child from last year! Well, I reckon that, as fun as Sports Day should be, a little competitiveness is always good too! “Competing in these sorts of events can be quite difficult, especially in weather like this. But overall it is a fun experience that brings your team super close together. That, along with knowing that your parents are sat praying that you win, the whole day becomes super-competitive – but in a good way. It builds great camaraderie with everyone urging everyone else on so that, together, you beat last year’s winner, who has been bragging about it all year! The entire day also makes for a great break from school pressures such as homework and exams and makes everyone that little bit more relaxed. So we can make sure their DIET is well taken care of with fresh, nourishing food, plenty of water (especially when it’s so warm and they are running around), healthy, energy-giving snacks such as bananas and nuts to give them a boost when their energy is flagging between races. We can make sure they get plenty of REST beforehand, an early night will ensure they are feeling tip-top and full of beans for race day. They’ll be getting plenty of EXERCISE on the day but don’t forget that the more energy we use, the more energy we have so a bit of activity the day before rather than a day of screen time should help them be on good form on the day. Just as important as diet, rest and exercise, is to look after their nervous system! Many top sportsmen such as Andy Murray and Usain Bolt are known to have regular chiropractic care, especially before and after a big event. It gives their nervous system a boost, helps the messages travel from the brain to the body and back again more smoothly so that the body can function and perform better and it helps the body recover quicker afterwards. So, why not give your child the advantage and book them in for an ADJUSTMENT before the big day? Give us a call. Finally, sports are obviously healthy for our kids’ bodies, but also for their MINDS. It can be very social and teach them how to focus, push themselves, build team spirit, and a sense of community. So get out there, crack open the sunscreen, stay hydrated and throw yourself into whatever event you are entered into whether it’s the hurdles, the wheelbarrow race or the mum’s three-legged race. And, give yourself the best chance by coming to see us first for a pre-race adjustment.